Are Protein Shakes For Me? Eaten enough chicken and eggs to last you a lifetime? If you’re pumping iron hard but not seeing the results, then it’s probably time to consider using protein shakes. There is a massive range of varieties on the market to choose from, so we’ll talk you through the basics. Protein shakes are one of the most effective ways to build up muscle without piling on unwanted pounds in other areas. Here’s the science bit: protein is the only macro-nutrient – as opposed to carbohydrates and fat - that actually builds and repairs muscle tissue instead of breaking down muscles for energy. So it is exactly what you need to turn those reps into pecs. Can’t I just eat more protein? Yes, if you have the time and inclination, but protein shakes offer a faster, nutritious alternative and can also be more cost effective than a shopping basket full of chicken. They can also stop you filling up on high protein foods which contain a load of fats and carbohydrates, such as soy, eggs and nuts. With so many on the market, for the most part it comes down to taste, price and what you’re hoping to achieve. A favorite for both beginners and pros looking to bulk up is the USN Hyperbolic Mass Chocolate 2Kg powder. Dubbed the ‘all in one muscle catalyst for the hard gainer’, this shake is scientifically formulated to help individuals with a fast metabolism gain muscle and strength. When’s the best time to have a shake? As a simple rule whey-based shakes are best for pre and post work-out meals because this ‘fast protein’ gets to work quickly. Predominantly casein-based powders are great taken before bed – the slow release proteins will absorb as you sleep. Most powders on the market are casein-whey blends and recommended for times in between workouts, so have them around the same time as you would have an ordinary meal. 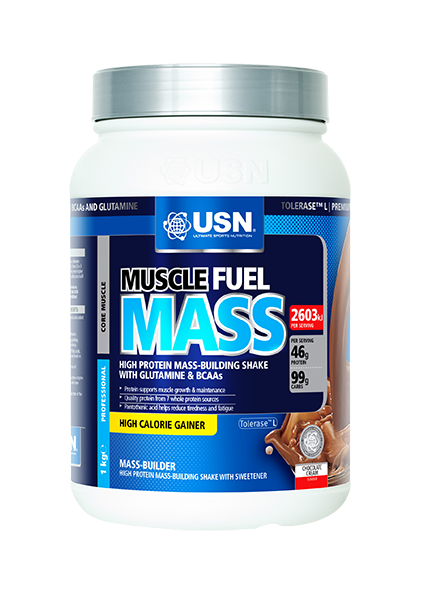 The USN Muscle Fuel Mass Chocolate 11lbs 5kg Powder has an advanced slow release formula which combines value protein with index carbohydrates to build and repair muscle tissue during and after workouts. As weight gain supplements go, it’s one of the tastiest. Blend with milk for a higher calorie, complete meal replacement. A word of caution: while protein shakes can be a great addition to a nutritious diet, you won’t get a Mark Wahlberg body without hard work too. So put the time in pumping iron and reward yourself with shakes throughout the day to make sure your hard work keeps paying off.